Pure-Fit® TC Tube Clamps represent a new generation of clamping technology for the pharmaceutical industry. They feature an outer body with no sharp edges, eliminating the potential for snags, scratches and punctures; a press-down locking system that is fully encapsulated to guard against untimely or unwanted release; a side release mechanism that facilitates secure, single-handed installation and operation; and an integral bore hole for absolute lock-out capabilities. Pure-Fit® TC's innovative design allows for complete flow stoppage, and the clamp can be installed over the tube in the normal fashion or put together after the tube is already part of a completed assembly. New! Pure-Fit® TCL Large Tube Clamps provide the same innovative clamping technology as Pure-Fit® TC, but are designed to accommodate large diameter and thick wall tubing applications. 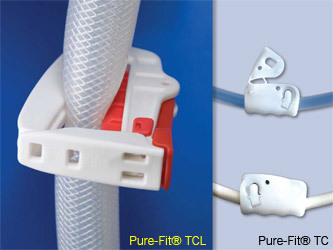 Pure-Fit® TCL is compatible with standard, braided (reinforced) and multilayer tubing. In addition to providing complete fluid stoppage, Pure-Fit® TCL can be utilized in the flow position and features an integral bore hole for absolute lock-out capabilities. Pure-Fit® is a registered tradmark of Saint-Gobain Performance Plastics.